While most of the skills we discuss at ISG require you to get out and experience them in the real world, almost all require some additional 'non-contextual' training; that is, the stuff we can do at home. We often use the example of physical fitness. For mobility, we need to be strong, have some measure of endurance, and be able to maneuver around obstacles while wearing our Sustainment Bag. We can't always get out and scramble over rocks, however, so it helps to have some kettle bells, a barbell and some exercises we can do at home to stay sharp. Boring the initial holes. 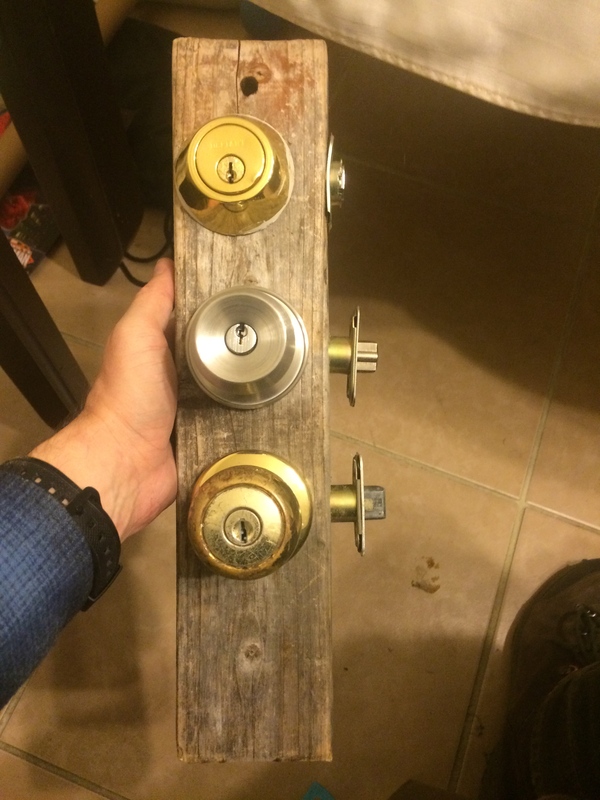 These lock towers used a 2x4, but if you have the choice, go with a 2x6. It'll give you a little more working space. 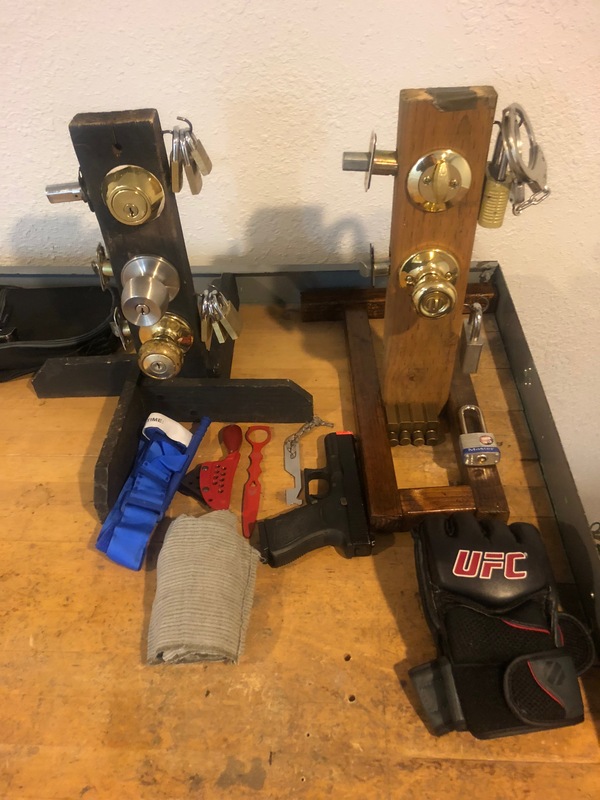 In the same way, lock picking can be practice at home using a simple training aid called a Lock Tower. With a Lock Tower, you can easily store and build skill on locks in your home (that aren't a part of your home) without fear of damaging something. We made our Lock Towers using pieces of 2x4" lumber, but in retrospect, a 2x6" piece would work better. Either way, you'll likely have to fit the locks to the wood with a hole saw and some drill bits. The basic Lock tower starts with a cutting hole for the face bore using a 2 1/8" hole saw bit. The bit is relatively cheap, and many can be adapted to a power drill which you should have already. 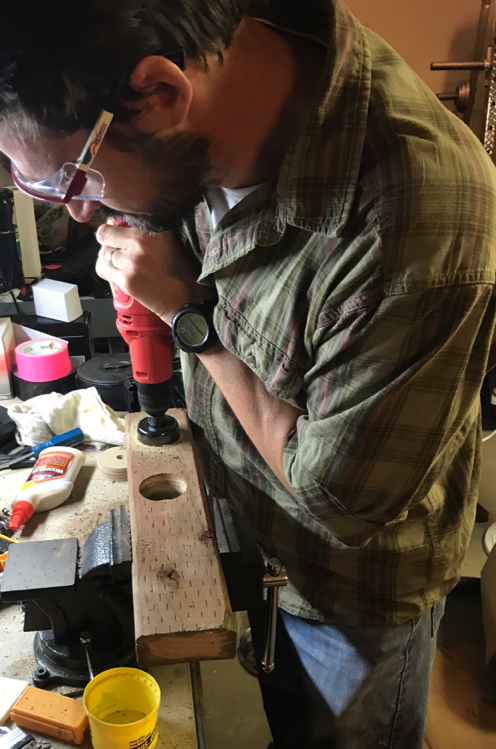 You'll want a bench vice as well, but if you don't have one, you can block up the 2x4 using other wood, a cinder block, or similar. We trust your creativity. Cut the lumber to the length you'd like. We've found that about 2 feet gets you enough space for three locks. Flip one or two upside down. In the real world, locks are often mounted upside down. 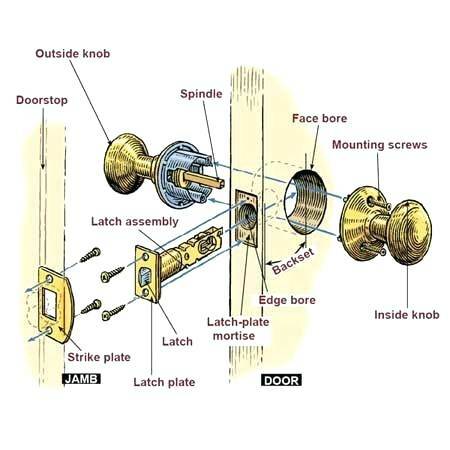 Mount them similar to what you'd see in reality: Most deadbolts are just above the doorknob. Space them at 1-3" apart. Don't give yourself more space than you'll find when you're out and about. Use a combination of difficulty levels. Use carriage hooks on the non-latch side to hold some padlocks. 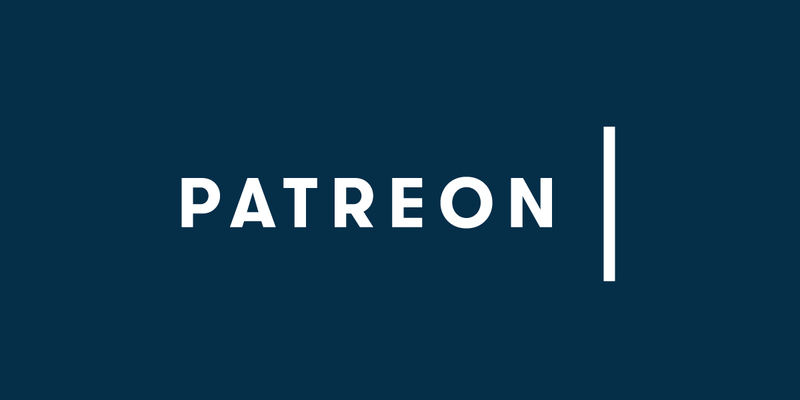 This will help your organization. Locks mounted to our rudimentary lock tower. It still has some work to go at this point. Once this basic layout is done, you can fabricate a stand. A simple two leg stand works well, but make sure they're long enough and level. We repurposed wood from other projects to build these stands, and one of them is unstable because of the short legs. The legs should be 8" or so. After you've got the stand painted and the legs mounted on, let it dry and you've got yourself a functioning lock tower. Locks all have their own personality, so keep in mind that you're going to figure these guys out and they'll get boring. Eventually, you'll want to swap them out, or build another tower to work on different locks. As you progress, consider upgrading to higher security stuff so that you don't get bored and stagnate. Also, depending on your picks, picking can slowly damage the locks to the point where they just don't open well. That can be a good thing, so don't just trash the lock if it starts getting stubborn... many locks are this way, so it's good to understand and be able to identify some of the 'grit' you feel trying to pick older locks. In addition to the tower, we found that adding some carriage hooks allows us to keep some padlocks on hand so we can switch up our game. While picking isn't for everybody, an understanding of how locks and physical security work are beneficial universally and a lock tower or two goes a long way towards rounding out your training room.  We hope that this article is helpful in guiding your efforts and we will be expanding upon our urban skills section in the future. Please feel free to share your results if you choose to create your own lock towers or training rooms.